Next stop on our Emilia Romagna tour for Taste Trails Rome cooking courses Italy is the Gelato University situated just outside Bologna, A place dedicated to making world class gelato with its kitchens , class rooms , lecture theatres and of course a campus Gelato shop. Ice-cream making you may think maybe one of the last things that required attending a university, but in Italy like all food, gelato is taken very seriously. Thousands of students from all over the world study the art of making quality ice-cream at the Carpigiani gelato University. Every year. Gelato lovers, and entrepreneurs who want to learn the secrets of making great ice-cream and take it back to their homelands pay between €800 and €1000 for a week of courses and accommodation at a nearby hotel. 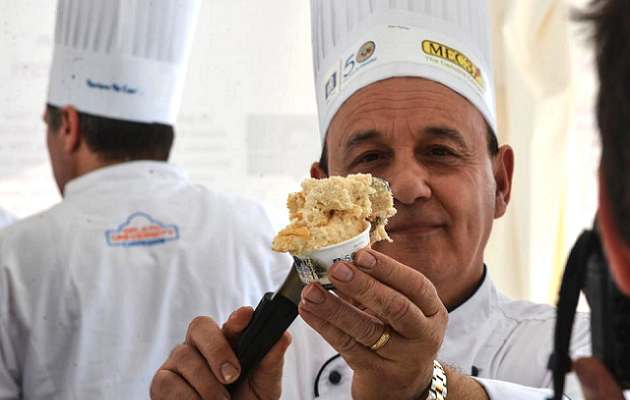 They attend technical lectures on traditional gelato-making techniques by veteran ice-cream makers, and take part in practical courses where they learn to use the world famous Carpigiani gelato machines. Carpigiani Gelato University has been around since 2011, and as more people around the globe fall in love with the Italian gelato, it gets more students with each passing year, the number of students has grown from 9,000 to 12,000 and for the first time in history, the number of foreign tourists has surpassed that of Italians. It is true that Italian gelato does have a world wide reputation and traditional Italian gelato is quite different. It uses less fat and is churned at a slower rate, creating a more elastic texture that’s slower to melt. Like many other foodie trends, interest in all-natural artisanal gelato is steadily growing. A tour around the Gelato Museum reveals that the iced treat has quite a history. In centuries past Mesopotamian rulers loved flavoured ice and the royal kitchens in the Ottoman empire produced fruit flavoured sorbets which then travelled around the Med. In modern times, Italian gelato is to be found in the UK and the US made by Italian immigrants who on witnessing the pure quality and in many cases synthetic industrial ice cream they found there , new they could do better and they did. Italian immigrants saw an opportunity to enter the gelato trade with its relatively low running costs after the modest initial investment in equipment. Location , creativity and total commitment to producing a fine product and so the Italian reputation for fine gelato spread around the world. On our whistle stop visit to the University we learned that the art of Italian gelato is not only the quality of ingredients , the endless possibilities of flavours or the techniques of the veteran gelato artisans but it is a science too and that there is way more to a world class gelato than meets the eye and we did come away thinking that anyone one wanting to start there own business in artisan Italian gelato then the course fee was worth every penny. Next stop on the Taste Trails Rome cooking course Italy is the coffee roasters of Caffe Cagliari - Bologna. With Taste Trails Rome cooking courses Italy you will on a daily basis be tasting fine artisan produce. Want to experience for yourself some of the best gelato in world? Well you can on our cooking courses. Giolitti Roma have for decades produced some of Italy's best gelato. Is it Italy's best ? Well we will let you decide . We run the cooking courses Italy through out the year from March to November. We look forward to seeing you !